Despite snowflakes falling outside my hotel window Friday morning, it was a pretty good stay in New England. 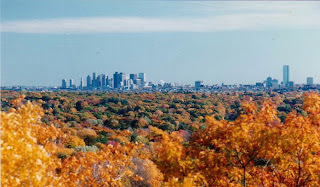 I was actually just outside the hub in Chestnut Hill, and my weekend was all work, so I couldn’t attend the Head of the Charles Regatta or frolic in the fall foliage. But the performance of BC’s Montel Harris (264 yards, 5 TD) against NC State notwithstanding, there were still plenty of significant events. I met Savannah Mayor Otis Johnson and his wife in an elevator in Newton, Massachusetts. Now that’s odd. The Heller School at Brandeis for Social Policy and Management was celebrating its 50th year, and that is where Mr. Mayor got his doctorate. I asked when they’d be flying home. They said they’re driving. So no fiscal shenanigans from Mr. & Mrs. HizzHonor. I had to interrupt my own production meeting because the reggae music from the hotel bar was so good. What house band plays a deep album track like Sublime’s “Pawn Shop?” I later met the musicians and told them they were great. 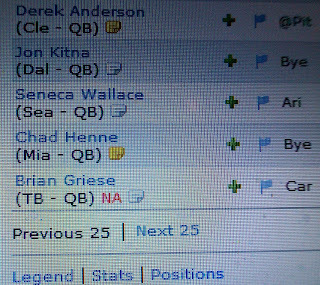 Even something as mundane as making out my fantasy football roster had an amusing aside. Joe Flacco is my QB, but I was a little nervous about starting him at Minnesota this weekend. Tony Romo is my other QB, and he’s on his bye week. So I scoured the Free Agent list for another starting option. 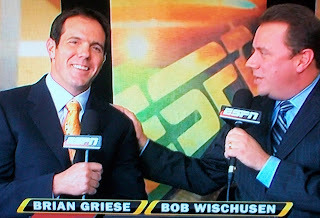 Brian Griese? He would have been a poor choice, not just because he’s unaffiliated, not because he can’t get it done anymore. But because he’s with the good guys now. I just spent the weekend with him and I doubt he will be trading in a headset for a helmet any time soon. Just as well - Flacco threw for 385 and 2 TD. Life is funny. I guess that’s why you have to write stuff down. EDITOR'S NOTE: This weblog was written before Mark Sanchez's public self-immolation, and comments regarding such will be ignored. Wow. My fantasy QB is Flacco too. And he almost stole that game against the Vikes. My other QB is Trent Edwards. Needless to say, I'll be looking for another one tomorrow.